With an education in still and film production from the prestigious Brooks Institute in Santa Barbara, Allen has worked for over 25 years in Broadcast and Corporate Television as a DP/Lighting Cameraman. Shooter stints with magazine shows at KOMO in Seattle and KDKA in Pittsburgh provided many opportunities to document some fascinating stories. This led Allen to WQED in Pittsburgh, one of the PBS flagship national producing stations. In eleven years at WQED, Allen traveled internationally and nationally working on documentaries, series, PSA’s and theatrical productions. Allen has had the opportunity to work with some of the most talented producers and talent in the business. In return, his camerawork has brought him numerous awards. Allen has won national and regional recognition, including two Regional Individual Achievement Emmy’s, and DP credits on over a dozen regional Emmy award-winning programs. 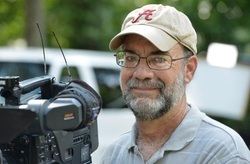 Allen was also one of the DP’s on “Barber From Birmingham”, which was a finalist for Best Documentary Short Subject at the 2012 Academy Awards. In addition to credits on many more national award winning shows, Allen was also a three time National Press Photographer Association Regional Cameraman of the Year while at KOMO in Seattle and KDKA in Pittsburgh. Since 1997 and his relocation to the South, Allen has shooting credits on everything from syndicated programming to corporate identity pieces. Allen can be found working with some of the biggest names in politics and entertainment (both television and cinema). Allen lights creatively and efficiently and does not let the equipment get in the way of the story. Based in Birmingham/Tuscaloosa and Atlanta, Allen routinely shoots in Alabama, Georgia, Mississippi, and the Florida Panhandle (and beyond).